Cyber Monday is not overrated, according to one Target executive who said the retailer has its "biggest, boldest plans yet" set for this year. "Pundits for a while now have been dismissing Cyber Monday, with headlines in recent years declaring it 'obsolete' or even a 'myth,'" president of Target.com Jason Goldberger said in a blog post. But Target is "going all-in" on the e-commerce sales day, he wrote. Target.com will offer 15% off sitewide on the Monday after Black Friday, along with 75 virtual doorbusters, the retailer said. The company said it's the first time Target has discounted everything on its website for Cyber Monday. Different department-wide price cuts will be offered all week "in areas like apparel, home and toys," Goldberger said, and those offers will start on Sunday, Nov. 29. The Cyber Monday deals will last just one day, however. Among the one-day discounts is an Xbox One and Gears of War bundle for $299.99. It's offering the same bundle in-stores on Black Friday along with a $60 Target gift card, but the Cyber Monday package will come with a three month Xbox Live subscription (worth $24.99) rather than the gift card. Other digital deals on Cyber Monday include half off a selection of children's digital cameras and Sennheiser earbuds, and $100 off a Swagway Hoverboard. Customers also get free shipping and returns. 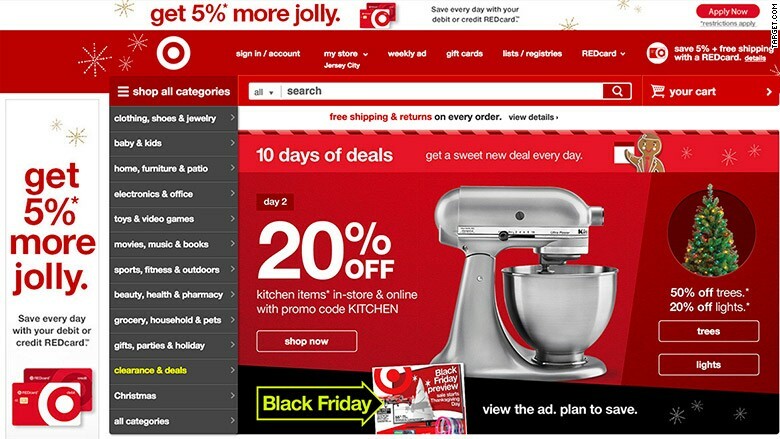 Though it's touting ambitions Cyber Monday plans, Golderberger said it won't be Target.com's biggest day of the year. Black Friday online sales are usually the largest. But Cyber Monday sales have boomed in recent years, and it'll probably "continue to grow at a healthy clip for years to come," Goldberger said. And digitally-savvy Millennials are driving that growth, he added. Last year, Target.com sold 40% more on Cyber Monday than it had on the year before. The retailer expects 2015 to be even better, partly due to an updated shopping app and mobile website. Are you working on Thanksgiving or Black Friday this year? Share your story with CNNMoney by emailing jackie.wattles@turner.com.